Note: The MMC is currently unavailable. Featuring monoblock power built into a super-compact footprint, the MMC is an amplifier that’s available in five- or seven-channel configurations. Delivering 221 watts of power per channel at 8 ohms 0.2% THD+N (and 368 watts at 4 ohms), the MMC provides 121db of dynamic range per channel using the same ICEpower® circuitry found in our mAMP. 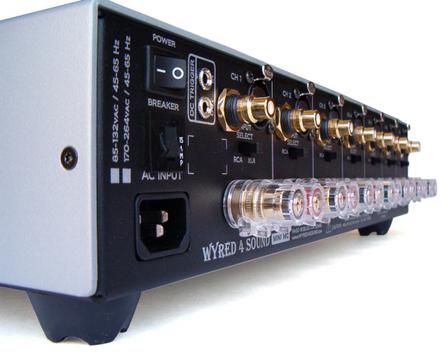 The input stage ensures superb synergy with any source component and the absolute best audio quality for your Hi-Fi system. Additional channels can be added at a later date if you need to upgrade from the five-channel version. Simply contact our service department for further information regarding the procedure and associated pricing. At just under $2,000 one would be hard pressed to find another five channel amplifier with such speed, clarity and deep black backgrounds. In short, the Mini MC does what it claims: produces copious clean, transparent power, from a compact, highly efficient and — at least in audiophile context — affordable package.